My creative journey consists of ebbs and flows, each serves a purpose and there is always something to be learned. There is one thing that I know for sure... I receive abundantly no matter what my circumstance is. It is my duty to keep my attitude about being brave in check (click here to read the story) I have a renewed sense of confidence that I am on the right path, creatively speaking. I have received compounded messages that have propelled me to step REAL BIG out of my existing boundaries. Tonight was a splendid example. 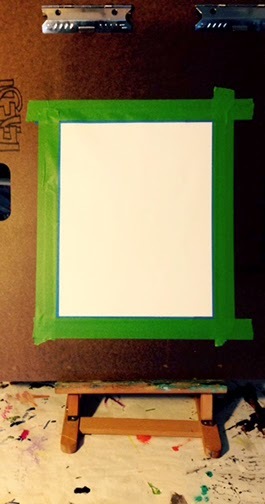 See this blank piece of artist paper taped to the board. 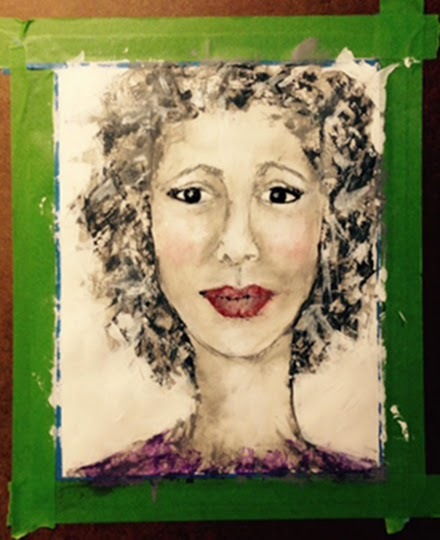 I declared openly on FaceBook that I was going to draw/paint a face using only a palette knife. I had never done anything like this before yet I firmly felt see that I had the capability. I set forth with joy in my heart. I put on loud music (I normally create in silence), I was dancing (sometimes rather erratically), and I had a blast. I had no clue what I was doing but I just kept going. Two hours later, she arrived. I had a fantastic group of women who were cherring me on, with their virtual pom-poms. Success is never accomplished alone. I am grateful to everyone who believes in me and who delivers encouragement and support. YOU believing in me helps me believe more in myself.